At TYL Adventures, making sure our guests have the experience of a life time is a important to us. We feel that the Captain and Crew are a large part of what makes a day excursion in the USVI & BVI a success. The onboard crew’s job is to help make your dreams a reality while maintaining your safety and comfort. Just as we want to get to know you better, we want you to know about us and how our experience can make your day memorable. I am a Coast Guard licensed 50 ton Master captain. Growing up I had a sailboat which I sailed and raced, for years. I spent many family vacations sailing in the British Virgin Islands since the late 1970’s. After working several years for a major electronics company, I attended culinary school and after graduation worked as a baker and cook at a catering company, for 10 years in Portland, Oregon. After leaving the catering business, I put my culinary education together with my computer skills and went to work with a restaurant consultant, implementing systems and controls in restaurants. In 2012, I decided it was time for another change! We formed a company, Time of Your Life Adventures, providing sailing adventures in the Caribbean, this had been a dream of ours for a long time. I am the First Mate and Chef. I have worked in the culinary field since 1975. I decided to further my education in the culinary arts, and I graduated from Western Culinary institute in 1989 and worked for The Red Lion Hotels. After a couple of years I decided I wanted to teach, so I spent the next 23 years as a Chef Instructor at Le Cordon Bleu Portland, receiving Chef of the Year twice and several Student Appreciation awards (student voted). I have been sailing in the British Virgin Islands since 1999 with Kelly and her family. I have taken several ASA sailing courses over the years both in Portland and the Caribbean. In 2012, I felt it was time for a change in my life and as I remembered My Mom’s favorite saying “a Turtle only moves forward by sticking out it’s neck“, I decided It was time to Live our Dream. 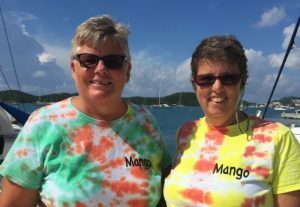 Kelly and I sold almost everything including our house and moved onto our 41 foot Catamaran… S/V Mango! I Look forward to having you visit on our boat for a Dinner, Daysail, or multi-day Charter!